Some of the most beautiful buildings in the world are designed to be both sleek and eco-friendly. And then there's the Strata Tower, which improves urban density and has three wind turbines. And it's been named Britain's ugliest new building. The Strata Tower won that questionable honor in an annual competition held by Building Design magazine. It's the tallest residential building in London, standing at 480 feet, so it's good from a density standpoint as well as having wind turbines. It was the cutting-edge, eco-friendly building that would soar above one of London's most maligned areas as a shining symbol of its long-awaited redevelopment. But yesterday, the Strata tower in Elephant and Castle, a 1960s-designed confluence of Tarmac, roundabouts and Brutalist architecture, picked up Building Design magazine's Carbuncle Cup for Britain's ugliest new building. The skyscraper's three large rooftop wind turbines, which its designers claim can supply 8 per cent of its energy requirements, have led some to call Strata the "Electric Razor". Others have dubbed the 43-storey building "The Lipstick". One of the judges, Ellis Woodman, wrote that the building appeared to be "auditioning for a supporting role in a James Bond title sequence. 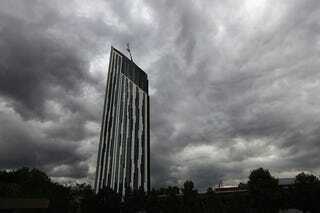 (A Bond title sequence, let us reiterate, in Elephant & Castle.)" He added that the Cup was being awarded for the building's "breakfast-extracting" ugliness. Photos by Dan Kitwood/Getty Images.